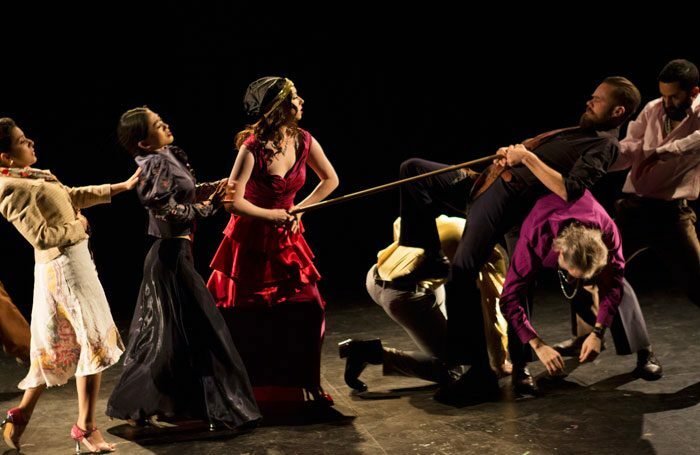 The legend of King Arthur is given a thoroughly modern retelling in Grail Project from Californian physical theatre ensemble Theatre Movement Bazaar. An opening tableau provides a nod to the sort of physical theatre that went out with the ark before the company get on track, taking the basics of physical dance theatre and applying all manner of genres and theatrical styles to it. This is a film noir telling, with tersely ironic dialogue, which draws out the existing feminist undertones of the myth, with Arthur’s sister Morgana manipulating the narrative and his wife Gwenevere driving it in her relations with Lancelot. It’s also pure soap in structure: the search for the grail is told through the eyes of servant and would-be knight Knut Blacksmith (Kasper Svendsen) in an ‘it was all a dream’ flashback. However, when Lamont Oakley rips off his yellow shirt as Lancelot and Paula Robelo’s Gwenevere removes her buttoned-up suit to reveal a spangly, figure-hugging dress as she sets about a karaoke version of I Feel Love, it all begins to get really interesting.